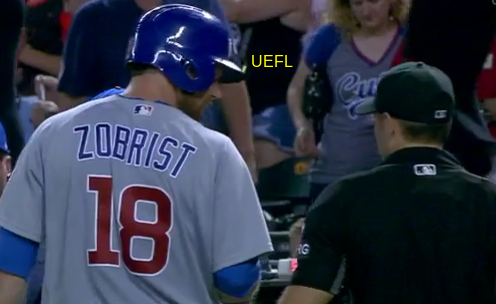 After striking out to end a Cubs game, Ben Zobrist called for a computer strike zone. The problem? A robo-ump would have ruled the decisive pitch a strike, just as plate umpire Mark Wegner did. Zobrist & Maddon question Wegner as he leaves the field. The Play: With two out and two on with the Cubs looking to tie their game against Arizona in the top of the 9th inning, Ben Zobrist took a 2-2 pitch from Diamondbacks reliever David Hernandez for a called third strike. Quality of Correctness: Replays indicate the pitch was located over the heart of home plate and at the hollow of the knee (px .264, pz 1.439 [sz_bot 1.504 / BOZ 1.380]), the call was correct. Mathematic Analysis: With the horizontal coordinate (px value) presenting itself in the "always a strike" (all else equal) range, we turn our attention to the vertical pz value and the question of whether the ball passed through the bottom of the strike zone. 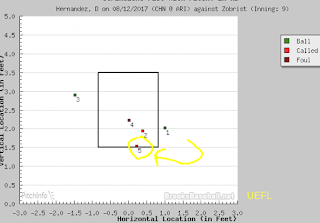 According to the computer Zobrist wishes would have replaced Wegner's pitch calling, the 2-2 pitch was vertically centered 1.439 feet above ground level while the bottom of Zobrist's strike zone (the hollow of the knee) was located 1.504 feet AGL. 1.439 feet corresponds to 17.27 inches and 1.504 corresponds to 18.05 inches. Thus, the center of the baseball was located .065 feet (or .78 inches) below the bottom of the strike zone. Brooks' representation of Pitch #5 (Called K3) to Zobrist. However, as we previously discussed in "Analyzing Strike Zone Analysis - Not So Easy Or Simple," a baseball is not a singular point, but a three-dimensional sphere with an average radius of just under 1.5-inches in length. Because a radius is measured from the center of a circle to its edge, we know that the 2-2 pitch to Zobrist, centered at 17.27 inches AGL, extended from approximately 15.77 inches AGL at the lowest edge of the baseball to 18.77 inches AGL at the highest point of the baseball (mathematically, this is 17.27"+1.5"). Recall that the measured bottom of Zobrist's strike zone was 18.05" AGL. Because the highest point of the baseball was located at 18.77" AGL, and 18.77" is greater than sz_bot's 18.05", we know that a portion of the baseball passed through the strike zone (specifically, we know that precisely 0.72" of the baseball traveled through the lower portion of the strike zone). 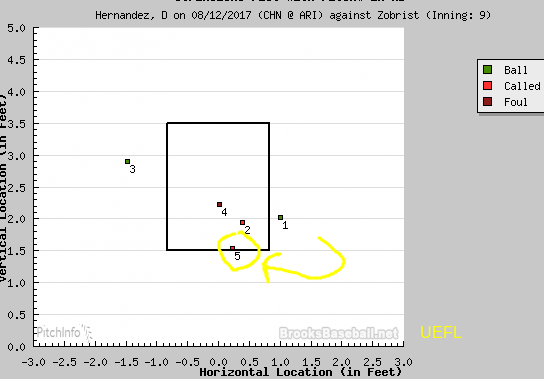 The Rule: What does the rule book say about a pitch wherein only part of the baseball travels through the strike zone? A STRIKE is a legal pitch when so called by the umpire, which...(b) Is not struck at, if any part of the ball passes through any part of the strike zone.